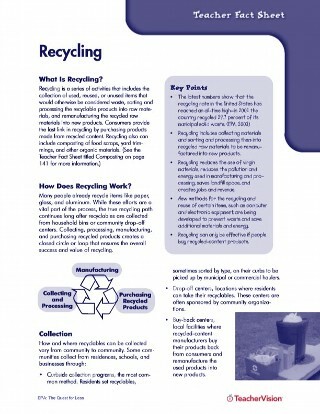 Your students probably already know the basics of recycling and why it is important. This unit of printables and activities from the Environmental Protection Agency focuses on collecting, processing, manufacturing, and purchasing recycled products to ensure the overall success and value of recycling. Recycling is a vital part of being environmentally responsible and living a "greener" lifestyle!